I have to assume that there is a very real chance that Putin or members of his regime will have me killed some day. If Im killed, you will know who did it. When my enemies read this book, they will know that you know. In November 2009, the young lawyer Sergei Magnitsky was beaten to death by eight police officers in a freezing cell in a Moscow prison. His crime? Testifying against Russian officials who were involved in a conspiracy to steal $230 million of taxes. Red Notice is a searing expos of the whitewash of this imprisonment and murder. The killing hasnt been investigated. It hasnt been punished. Bill Browder is still campaigning for justice for his late lawyer and friend. This is his explosive journey from the heady world of finance in New York and London in the 1990s, through battles with ruthless oligarchs in turbulent post-Soviet Union Moscow, to the shadowy heart of the Kremlin. 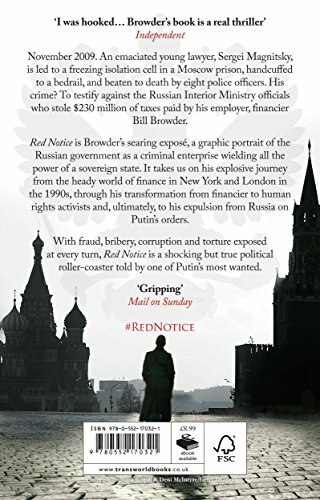 With fraud, bribery, corruption and torture exposed at every turn, Red Notice is a shocking political roller-coaster.